You need a glove that will stand up to the rigors of the grease and grime. 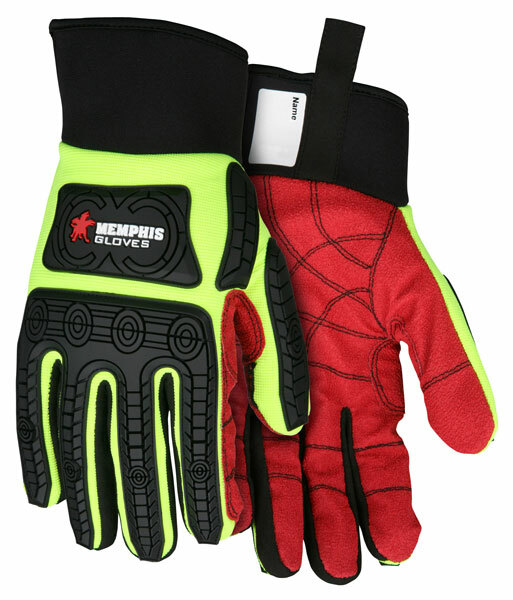 Our Memphis Multi-Task gloves will give you the grip, durability and protection you need for anything your boss can throw at you. The Memphis Multi-Task 915 features a red PU coated synthetic leather in the palm, reinforced thumb crotch and rolled fore finger. The scaling TPR on back of the hand, fingers and thumb and unique metacarpal joint TPR provides extreme back of the hand protection. The hi-vis lime 2 way stretch spandex fabric provides comfort and visibility. The neoprene cuff with pull-tab and gussets offer a better fit and the ID label allows for individualization. The synthetic leather fourchettes add to the durability and comfort of the 915.